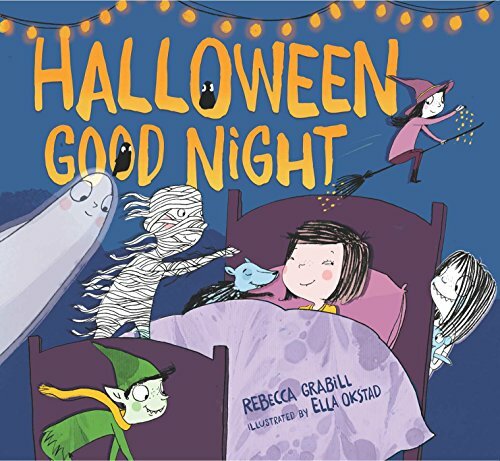 Following is an outline for a full five days of Halloween Fun, covering all subject areas, and centered on the 2017 picture book release by Rebecca Grabill, Halloween Good Night. Here’s how it works. Day 1: Read the book, do stuff. Day 2: Read the book, do more stuff. Day 3: Read the book, do… Continue all week! Wait, you’re saying read the same book every day for a week? Yes. Yes, I am. You’ll add other books as you like (I’ll suggest my favorites), and crafts and videos and activities. But the absolute crux of this immersive unit study is the book. Why is Re-reading a Book so Important? This article at Read Brightly explains it, but to summarize: reading the same book multiple times is good, no, great for kids! Think about what happens for you, as an adult, when you read that bedtime story for the millionth time. You start to anticipate the good parts, you master the vocabulary, you can predict what’s going to happen next, you become so confident you can read it with the lights off. While these “perks” might lead to mind-numbing boredom for an adult, a child is just learning about anticipating and words and prediction and confidence. Read the same book and you’re giving a child a tremendous gift. A personal story… last fall I switched Penelope to a curriculum called Five In A Row. I’d first heard of it more than a decade earlier when my oldest child was little, and I took one look and thought, “The same book five days in a row? No thanks.” But I decided to try. And rather than growing bored by day five of The Story of Ping, Penny was excitedly grabbing the book off the shelf and settling in to hear it again. And again. And again. She wanted it at bedtime, at breakfast, at noon. And amazingly, this enthusiasm repeated with (almost) every book we studied! So that’s to say, yes, read Halloween Good Night every single day. Bonus: you’ll get crazy good at the rhythm and rhyme. Below I’ll provide a suggested schedule, but don’t feel burdened to do everything! Take what you like, leave the rest. No guilt, only fun. A quick note about the printables used in this guide. Most come from a resource I created specifically to accompany this book. GET THE MEGA HALLOWEEN PRINTABLE PACK HERE! You can download the complete printable pack at the TPT website. And if you love it, leave a review! Read Halloween Good Night and count the creatures on each page as you read. By the end, children love “guessing” how many creatures are on the stairs, or hiding in the closet (and they’re usually correct, since it’s a counting book!). Talk about Globsters. What is a Globster, anyway? You can find out more about Globsters (and all the creatures in Halloween Good Night) in this series. Be forewarned, not all the videos are appropriate for young children. The zombie make-up vid in particular, is rather gory (but super cool!). Read the book again, and this time use the number flashcards from yesterday to put the story in order! Place the cards from left to right in ascending order. Sequencing is an essential task for early literacy because it helps teach which sounds follow other sounds when making words. Today also talk about familiar creatures. Do your students know about vampires and ghosts and mummies? Which Halloween creatures are their favorites? As you read the story today point out any new vocabulary words. What do students think the words mean? Take a moment to discuss definitions. The book Halloween Good Night follows a predictable rhythm. Have your students clap the beat as you read. Also try using musical instruments or clapping syllables in words. Print the Rhyme Puzzle and use to find rhyming words. What rhyming words can you find in the story? Use the Counting Flash Cards available in my Mega Halloween Freebie Pack at the TPT store. You’ll find more than 25 pages of Halloween Fun in that printable pack, including everything you’ll need for this unit study. Plus a heap of extras. A few of the extras: Give a Ghoul a Haircut scissors practice sheet, Monster Memory matching game, Magic Words phonics, and more. For math practice, print the number flashcards and have fun putting them in order! Print the Count and Trace number worksheets and the Number Stories cards. Practice counting forward and backward. Add all the cards from the Number Stories pages of the MEGA HALLOWEEN FREEBIE PACK and use them to create your own number stories. Three Goblins and two Globsters went to the Halloween party. How many creatures are at the party? 3 + 2 = 5! This video gives a succinct and fascinating True History of Halloween! Why do we dress up in scary costumes anyway? Do your students think it’s funny to find bacon in the trash? What do we throw away and what do we recycle? The printable pack has two map resources. First, a maze for younger students. Help Globster find her way to the Halloween party! This map exercise teaches map terminology like compass rose and legend, and encourages students to make a map of their desks. The book Halloween Good Night begins in the swamp and travels through the forest, meadow, playground, city, as the Halloween creatures get closer and closer to their final destination. Discuss various ecosystems. What would you find in the swamp that you might not find in the forest or meadow? What’s in the alley that isn’t on the playground? Use the worksheet from the MEGA HALLOWEEN FREEBIE PACK to reinforce the lesson. No Halloween lesson would be complete without talking about night animals, especially bats! Use the worksheet in the Printable Pack to determine which animals are awake during the day or at night. For art click any of the ten “creature” posts in the Language Arts section. Each post has crafts curated especially for that creature. Or find my all time favorite Halloween crafts here! Plus, find my favorite Globlin crafts. Or download the Goblin coloring page below. Find the MEGA HALLOWEEN FREEBIE PACK at TPT. And find the 10 days of Halloween with fascinating facts about every creature featured in Halloween Good Night here. And of course, you’ll need copies of the book, Halloween Good Night!